I recently had a class on 6 types of pudding. 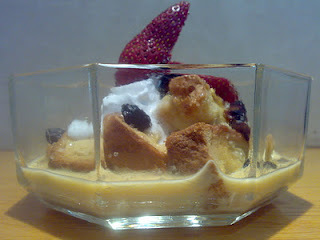 One of the puddings that my students loved was the bread pudding. Regardless of its simplicity in ingredients and appearance, it is to me one of the best warm desserts that goes perfectly well with a cup of steaming hot coffee. Preparing this old-fashioned dessert means your leftover bread slices will not go to waste. In fact, if you find it hard to finish a loaf of bread before it's expiry date, freeze it until you are ready to make this scrumptious bread pudding. I think the media is largely to blame because of this! Women look at the various magazine covers and wish to look like the cover girls they see. "Oh! I wish I was that slim", "Oh! I wish I had her abs", and so on. What they don't realize is the work that goes into that magazine cover. Most mag covers are air-brushed so the model looks 'perfect'. And many times, to look as 'fit' as they do, the models have to do all kinds of 'tricks' to look so 'perfect'. And these tricks can sometimes be dangerously unhealthy and should never be adopted long term to have that perfect bikini body! Even bikini models have an off and on season. Even they don't adopt those crazy plans all year round! Imagine cutting out fruit totally for weeks or even months!